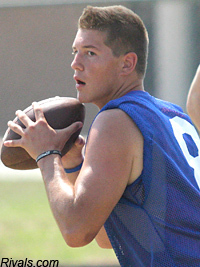 In 2011 the Sunflower League had a big-name transfer in Orange Mooney. This season we have an even bigger name, as it appears that Jordan Darling's transfer to SM East is complete. My sources had indicated as early as December that Darling would be transferring to SM East, but it wasn't until this past week that things were finalized. Darling is your prototypical gunslinger. He stands 6-foot-4 and weighs in at 225 pounds with a cannon attached to his right shoulder. This week he received his first FBS offer from Charlie Weis and Kansas, but it's expected that many more are to follow. He's received heavy interest from Oklahoma and Ohio State throughout his prep career. Darling first entered the high school scene as a sophomore at Lakota West High School in West Chester, Ohio. Lakota West went 3-7 that season, but Darling wasn't to blame. He emerged as one of the top high school football prospects in Ohio for the Class of 2013, and big expectations set in. However, Darling didn't return to Lakota West in 2011. Instead, he transferred to Midway High School in Waco, Texas to be closer to his mom, a major in the U.S. Army, before she was deployed to Afghanistan. Darling split time at the quarterback spot for Waco Midway (who plays in Texas Class 4A) helping to lead the Panthers to a 13-3 record and an appearance in the 4A state championship game where they lost to Lake Travis. During the regular season Darling passed for just over 1,500 yards and 14 touchdowns. Darling will battle it out for the Lancer's starting quarterback spot with the incumbent Nick Pirotte, who passed for 850 yards and five touchdowns in six games filling in for Dakota Collins in 2011. 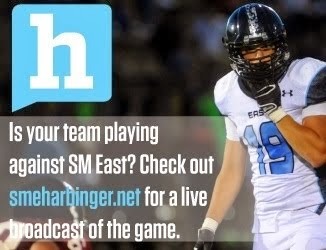 One thing is for sure--SM East's stock is rising for 2012. "Darling to Relihan, We are going to be hearing that alot this upcoming season"
That QB/WR combo will tear up the shawnee teams this year. Not sure what SME looses on defense but they will probably avg. 34/game and let the chips fall were they may. Yes OS will be on a roll again but SME should do pretty well. The record at his first school is evidence that no matter how good one player is the team has to have overall strength to achieve great success down the road. I'm not trying to put down SME or anything. I just think they need to work hard so all this hype isn't for nothing... and I do think that they can do that. Olathe North had a bit of a problem with whole team consistency and we ended the season on a bad note. But this year will be different and it is showing through conditioning. That is all. I wouldn't put O-South on a pedestal just yet. They lost almost 3000 yards of rushing in Ward and Colbert, their whole offensive and defensive line (minus their Sophomore "man child"), and their main receiving and deep threat. Not sure what's coming up behind them. Look out for both Lawrence schools this year. Those are my top two going into it. Didn't both Lawrence schools loose several of their key offensive players. "fishy that two years in a row SME has had a transfer quarterback..."
Found out that Mrs. Darling has been transfered to Ft. Leavenworth so that should answer any questions. Except Darling isn't going to Leavenworth, or Lansing, or any high school withing 30 miles of Ft. Leavenworth for that matter. Just playing devil's advocate here. As for the Lawrence schools, Free state was a very young squad last year, and it was impressive they finished with a winning record. Lawrence lost Anthony Buffalomeat and a couple lineman, but still have Strauss and a couple of those receivers. The 2012 season is going to be an exciting one in the Sunflower League. There is a ton of returning talent and guys like Darling are only increasing the expectations league-wide. Besides, from my house(in Shawnee) to Ft. Leavenworth is an easy drive. I know his dad is a retired officer so he may be working in the area. Just watched his HL tape. He is big, but honestly wasn't that impressed with his arm overall. Should do decent in this league, but I can't remember a pure pro passer did great in this league besides Carder. I'm still looking at Strauss from Lawrence, Guild from SMS, and Randall from LV to be the stars of the league next season. E did you watch his soph film at Lakota West or JR film at Waco Midway? Good Question. I'm not sure. If it happens to be his Soph HL, then I'm sure he's improved. I sure hope he does well here, I'm just trying to be objective and not get caught up in the "ooooo, Texas player moved here so he must be GREAT." Good luck to him. To build off of what E said: 20 players off of the 2011 all-league first and second teams are returning next year. 6 of them are from Olathe South, 3 from Free State and 3 from Leavenworth. Interestingly enough 0 are from Olathe North, and the 1 from Olathe East is their kicker. Lawrence and SM West have two apiece. In truth, I've completely forgotten of this guy's existence.